Some people spend years studying Spanish before they finally get around to speaking the language. But here's a better idea. Skip the years of study and jump right to the speaking part. Sound crazy? No, it's language hacking. 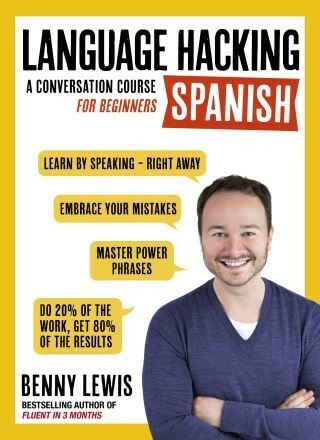 Unlike most traditional language courses that try to teach you the rules of Spanish, #LanguageHacking shows you how to learn and speak Spanish through proven memory techniques, unconventional shortcuts and conversation strategies perfected by one of the world's greatest language learners, Benny Lewis, aka the Irish Polyglot. Using the language hacks - shortcuts that make learning simple - that Benny mastered while learning his 11 languages and his 'speak from the start' method, you will crack the language code and exponentially increase your language abilities so that you can get fluent faster. It's not magic. It's not a language gene. It's not something only 'other people' can do. It's about being smart with how you learn, learning what's indispensable, skipping what's not, and using what you've learned to have real conversations in Spanish from day one. #LanguageHacking takes a modern approach to language learning, blending the power of online social collaboration with traditional methods. It focuses on the conversations that learners need to master right away, rather than presenting language in order of difficulty like most courses. This means that you can have conversations immediately, not after years of study. Each of the 10 units culminates with a speaking 'mission' that prepares you to use the language you've learned to talk about yourself. Through the language hacker online learner community, you can share your personalized speaking 'missions' with other learners - getting and giving feedback and extending your learning beyond the pages of the book . You don't need to go abroad to learn a language any more. Irish native Benny Lewis speaks over ten languages - all self-taught. In 2003, he spoke only one language: English. After university, he moved to Spain and was soon frustrated that he could not speak Spanish after six months of studying. So he decided to abandon traditional learning approaches and just start speaking - and everything changed. Today Benny is known as The Irish Polyglot and speaks Mandarin Chinese, Arabic, French, German, Spanish, Italian, Portuguese, and Hungarian. He is the author of the bestselling book on language learning, Fluent in 3 months. He also runs the largest language learning blog in the world, www.fluentin3months.com, where he breaks down the language learning process for busy people. Lewis is a full-time 'language hacker', and devotes his time to finding better, faster, and more efficient ways to learn languages. For the first time, he has applied his methods to helping people learn specific languages in his new Language Hacking series. Sarah Corrigan commented on Language Hacking Spanish from Language Hacking Spanish: Just started with this and seems to work perfectly. Katherine Holley commented on Language Hacking Spanish from Language Hacking Spanish: This app is great! No issues as others have reported, so the updating must have been auccessful. Great audio content from a great book. definitely recommend!